Ninjatown mastermind, Shawnimals was kickin’ it at Kidrobot New York last night for the release of his cuddly new Ninjatown Plush collection. Tickle fists of fury were flying as Shawn signed and sketched for all Wee Ninja lovers throughout the evening. There will be more ninja-y goodness as Shawnimal’s signing tour continues tonight, October 3 at Kidrobot San Francisco from 6-8pm. 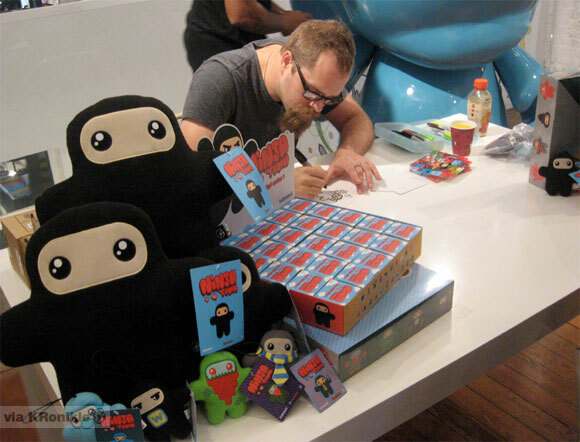 The post Wrap Up – Ninjatown Plush Signing Tour With Shawnimals At KRNY appeared first on Kidrobot Blog.